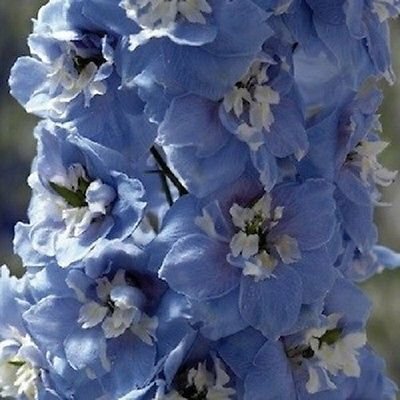 25 Mid Blue Magic Fountains White Bee Delphinium Flower Seeds Perennial | Fountain City Art Ctr. 25+ SEEDS. TRULY SPECTACULAR! CAN BE STARTED INDOORS IN WINTER TO BE TRANSPLANTED OUTDOORS IN SPRING, OR CAN BE SOWN DIRECTLY INTO THE GROUND IN SPRING (AFTER WINTER'S LAST FROST), SUMMER OR FALL. DELPHINIUMS ARE TALL, MAJESTIC PLANTS WITH SHOWY OPEN FLOWERS. THEY ARE LONG-LIVED STURDY BUSHY PERENNIALS. WILL BLOOM THE FIRST YEAR. THESE 48 INCH TALL FLOWERS ARE MID-BLUE WITH WHITE BEE CENTERS. PREFERS FULL SUN/PARTIAL SHADE AND MOIST SOIL. IDEAL FOR CUT FLOWER ARRANGEMETS AND WILL LAST 6-8 DAYS IN A VASE. BLOOMS EARLY JUNE THROUGH LATE FALL. DELPHINIUMS ARE DISEASE RESISTANT. THESE PLANTS WILL REWARD YOU WITH GORGEOUS FLOWERS YEAR AFTER YEAR. If you have any questions about this product by sow_blessed seeds, contact us by completing and submitting the form below. If you are looking for a specif part number, please include it with your message.